With over 25,000 installations worldwide, Griffin Filters provides the experience and dependability your operation needs. Our experience working with the world's top manufacturers gives us unique insights into the needs of numerous industries. We design every dust collection system to meet our customers' specific needs. This means optimal performance for years to come, reduced downtime and lower long-term maintenance costs. 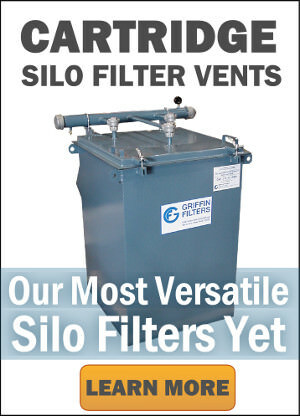 Griffin Filters has been a leading manufacturer of dust collection systems for over 50 years. We started out as Dusty Dustless, Inc., making shaker-style collectors for the concrete, aggregate and construction industries. With the development of pulse jet collectors, Griffin's markets quickly expanded to include industrial process applications. Over the last 50 years, Griffin has installed over 25,000 dust collectors worldwide. Our products pages illustrate our unusually large selection of standard dust collector models. Our selection allows us to match the widest range of application needs, from solids processing to product recovery and air pollution control. But the core of our business is innovative design and application knowhow, so if our standard models don't meet your needs, we will design a dust collector that can. The Griffin focus on individualized solutions means optimum performance and cost effectiveness for our customers. It provides single-source convenience and economy. And it's how our company has earned ongoing business from many of the world's top manufacturers. Griffin also offers an extensive selection of spare parts, filter bags, and cages for dust collection systems. If you don’t see what you need, contact us. We regularly provide custom or special order products at competitive prices. Interested in Being A Rep? Griffin Filters is always seeking the best companies to partner with. Fill out our representative questionnaire.